Zoo Med Porcelain Clamp Lamp Holders are made from heavy gauge painted aluminium. The ceramic socket ensures safety and the lamp can be used with the Clamp Lamp safety cover for added protection. 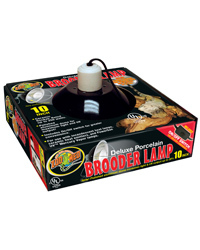 The lamp is available in three dome sizes to suit most vivariums and terrariums.